Hey there xxloveholic, my name is Beulah (xxloveholic) and I'm so glad you're here - welcome to 4 Corners! 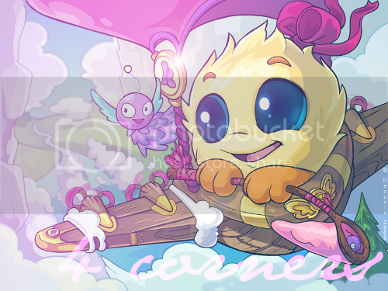 4 Corners offers you a GIMP guide/tutorial using GIMP 2.6. I hope you find my site helpful! 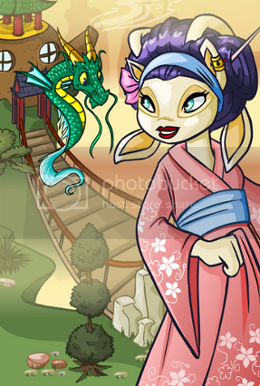 First ever on Neopets comes a GIMP 2.6 tutorial that takes you through each step one by one with visual images so that you can see exactly what needs to be done. If you don't see a tutorial up here that you would like to see or have a question about an existing tutorial, then send me a quick mail and I'll try and have it up within a week. If you have a question, don't be afraid to ask and I'll try my best to answer it or direct you to who can. GIMP is an acronym for GNU Image Manipulation Program. GIMP is an image editing/manipulation software that's distributed for free. Using this program will allow you to retouch and edit images as well as create small animated GIFs. GIMP is a great step up from using MS Paint and it's simple to use if you, like myself, are interested in image manipulation. so all-in-all---GIMP an open source application, that is distributed for free, has all the power, features and capabilities that GIMP does is amazing. Phew, it's been a very long month so far since I've started working. As far as tutorial is concerned, I'm don't really know what to do a tutorial on. So, the first 3 tutorial requests I receive, I will start on. Mail me! Message me! I absolutely love receiving mail! XCF: Not usable for the internet. I found this to be only found in GIMP; it saves as a GIMP file. You can go back to this image and continue editing where you left off. However, you can not undo any actions after you have closed and re-opened the image. See the difference? Yes, one is closer the other is not. But take a good look at it...the left image looks squished (not cool, unprofessional and not very attractive). If you want to make your image more professional you would need to do a few things. First, see what your looking for (ask yourself: do I really need that part of the image, can the image do without that part, can I see the main point of the picture). Perspective. What is eye-catching to you and your audience? In the image I used you can see that in both images the subject (the Wocky) is running in a flower field and you still can see the clear, blue sky. You don't really need everything in the picture, you can crop the image and still have the same perspectives. 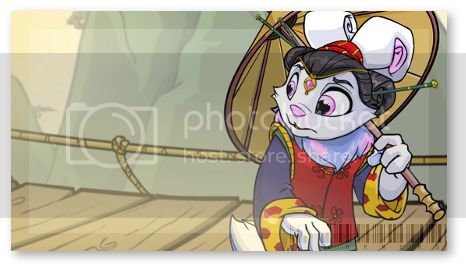 If you already have a set banner size, take your image making sure when you scale it down that your lock is locked. 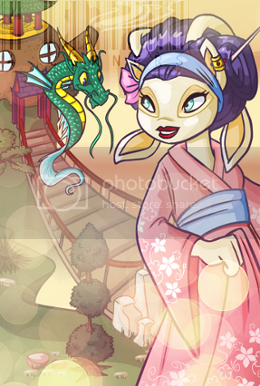 Scale your image just enough so that you can get you main subject (image) in to your banner template--as seen in the right picture. 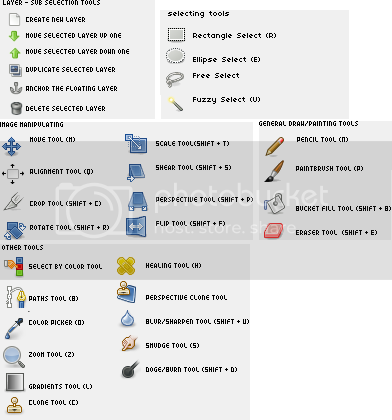 There are many ways in which you can save or create a gimp brush. GIMP brushes needed to be saved and filed as a .gbr (GIMP brush) otherwise it won't be a brush. 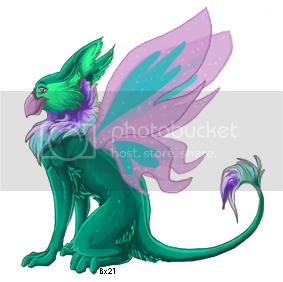 If you are download a PSP, CS3 brush---anything other than a PNG you need to convert to a PNG it with an AbrMate or WinRAR software before continuing this tutorial. Try not to use GIF files. It will mess up the coloring sometimes. JPEGs are fine, but it has lower quality which makes it harder to use. This is only for images that are already .grb file. Grab an image you want (choose from one of the listed in the resources if you don't have a picture already), drag it onto your desktop. Go to (COMPUTER USER) personal folder » .gimp-2.6 » brushes. 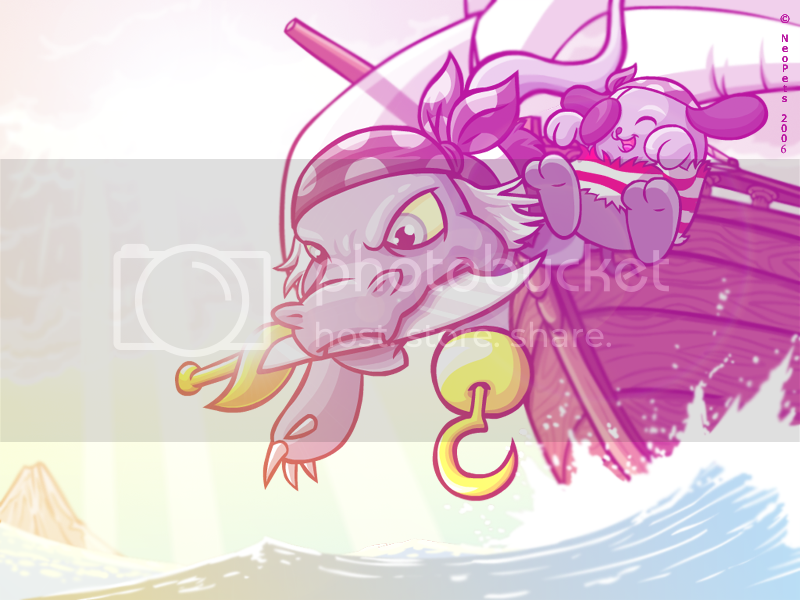 Drag you image(s) to the brushes folder. Refersh (if it's open) your GIMP brushes and you are now finihsed! 001. Open your image to GIMP. Select and copy one image that you want as a brush. Re-name your brush and you're finished! Here, I'm assuming that you have just downloaded GIMP. So I'm going to start from the very basics and give you bits of tips and advice here and there. (the text on the left doesn't have anything to do with adding tabs...so don't worry about that part just yet) The highlighted part is what you'll need to look at. Press the arrow and it'll provide drop down menu. Go to Add Tab then select Layers. Add/remove as many as you need. And you're finished! This window allows you to quickly access all of the tools available. When you click on a tool, the lower half will change depending on the tool you select - so go ahead, try a few. One of the best ways to get to know GIMP is to play with it. Concerning tabs, I personally prefer keeping Layers, Fonts, Brush, Gradients and Patterns up. 001. 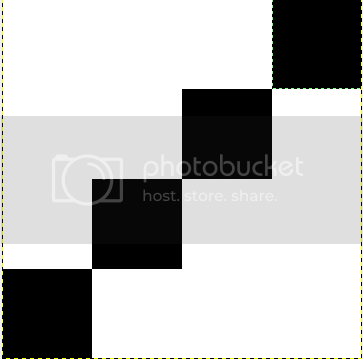 Create a new image (CTRL + N) and set it as a 4 x 4 image (pictured below). 002. 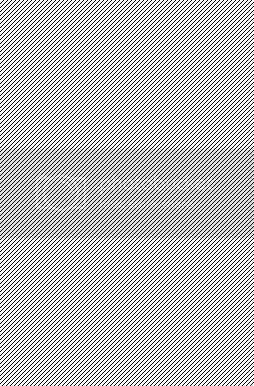 Zoom in so that you can see the image you're making clearly. 006. Select the Brush Tool and then Open the tool dialog. 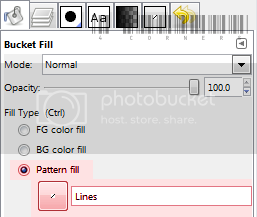 Select Pattern Fill then click the image right below and select the small black line you made. 007. 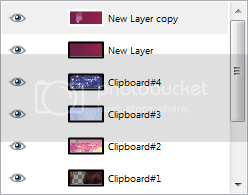 Select New Layer. 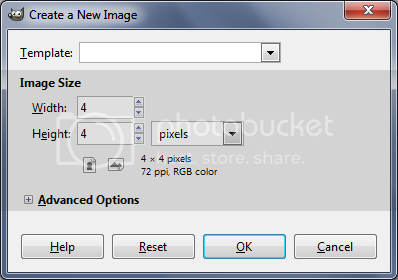 With your Bucket Tool, click on the image or press (CTRL + ; ) on your keyboard. 008. Change the New Layer's Mode into Soft Light. Adjust the Opacity to 15.0. Congratulations! You've now finsihed your image. The words look bold at first then when you add the Alpha Channel it will unbold. 002. 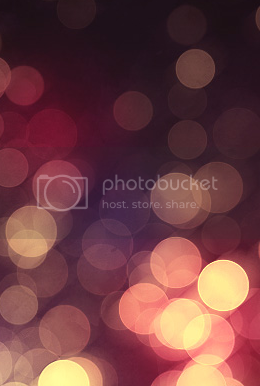 Go to Filters » Light and Shadow » Drop Shadow. A new window should pop up. I usually set my Offset X and Y to 4; you can choose what ever you like and press Ok. Question or Comment On this section? In this section you will learn about gradients. What they are, how they work and what kind of gradient you should use. 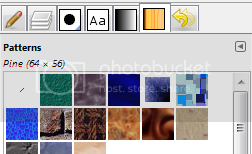 Hover over the square images to see the color code. 005. Change your mode to Screen and move your opacity line down to around 75.6 so that the image won't look too colorized. Now you're finished! 001. Pick your image and open it up in GIMP. 004. Change the Opacity of your texture layer down to around 80.0 or 90.0 if you're using something just like this tutorial. If you're using more of a darker, hard texture, you might want to lessen it down maybe even to around 50.0. You can keep adding layers and layers of textures if you want. I suggest, however, to keep it to a limit to where it's not so busy looking. 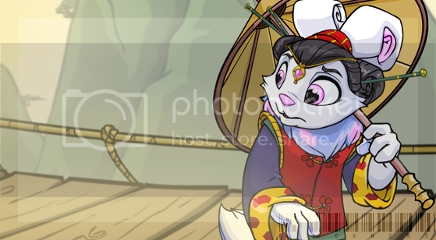 Images are scaled down for the tutorial. Drag the image to see actual size. 001. Take your image--any size will do. Mine is 800x326. Start by smudging the areas that are around your main subject towards the opposite direction so that no other faces can bee seen. 002. Take your Smudge Tool and select the fuzzy select and change the opacity down to 80 or so. 003. Create a New Layer, add a Gradient ( I used 3e1229 & 712448 as for colours) and pick your mode to Overlay. Next, change your new layer opacity down to about 39.9 or so and using your Erase tool, erase the part of the gradient where the subject is so that your subject isn't coloured. 004. Again you're going to create a new layer and add the same gradient. This time you're going to need to change your mode to color and still using the same opacity. 006. So, you're pretty much going to be doing the same thing for a while so make sure you have some good music you're listening to! Hee hee. 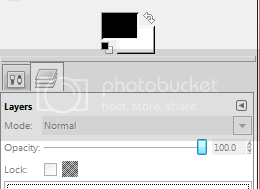 Okay, so you take your next image (below) and screen that one changing the opacity down to about 20. Don't forget to erase the subject area! 008. 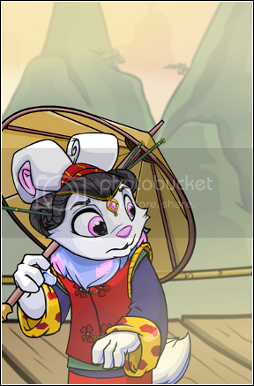 Finally, you can add your last stock image! Mode: Screen, Opacity: 51.6. Save as PNG let GIMP merge all layers and you're done. Finished! 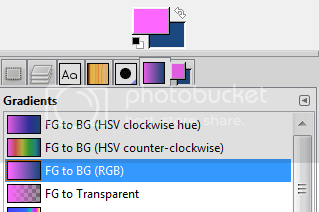 Make sure that your two gradient layers are both above all layers otherwise your image will look different. Layout Template from That Kills Me. Bullets and Divider by The Lunch Box. Adoptable by Butters. NEOPETS, characters, logos, names and all related indicia are trademarks of Neopets, Inc., © 1999-2011.® denotes Reg. US Pat. & TM Office. All rights reserved.